The public map below can be starred for used in the Google Maps application and smartphone web browsers. Main North reserve gate address is 711 Neeson Rd Marina, CA (this is not the reserve mailing address). 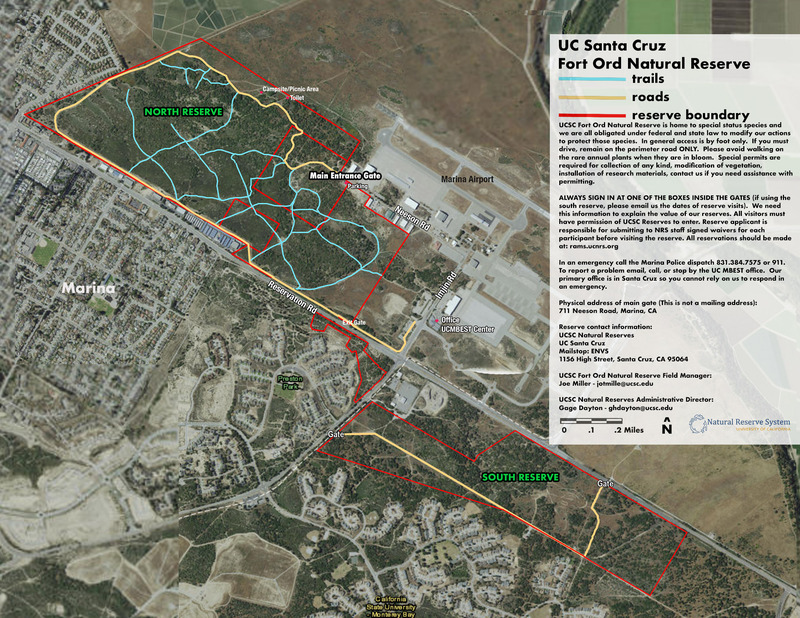 In general, there is no vehicle access at UCSC Fort Ord Natural Reserve. Additional interactive maps detailing research facilities are available upon request. Click the button in the top right of the inset below to go full screen, then zoom in to explore or print sections that you need to use. This is a pdf of the Google map directions. Alternately, search 711 Neeson Rd. Marina, CA (which is not the reserve's mailing address) in your preferred mapping application. The main gate to UCSC Fort Ord Natural Reserve is at the end of Neeson near address destination.